The entry Mercedes S class in the U.S. currently has a mild-hybrid powertrain. NEW YORK -- TTo meet tightening global fuel-economy standards, Daimler executives in Germany are considering a radical plan: make the flagship S class model line hybrid-only. Mercedes-Benz dealer sources tell Automotive News that Stuttgart executives are considering switching all future S-class luxury cars -- including high-performance AMG models -- to full hybrids, offering no models with only internal-combustion engines. The idea is drawing fire from some U.S. dealers, who worry that hybrids are not perceived as true performers in the market. The switch would take place globally with the next-generation S class, which is due in Europe in 2013 and in North America a year later. Only a handful of Mercedes dealers have been briefed on the plan. Those dealers will meet this week with Joachim Schmidt, sales and marketing chief at Mercedes-Benz Cars, at The Masters golf tournament in Augusta, Georgia. Mercedes is a sponsor. Dealers say they have been vocal about their opposition to such a switch, which they feel would change the perception of the brand. Tommy Baker, chairman of the Mercedes-Benz dealer board and a Charleston, South Carolina, Mercedes dealer, said: "The most important thing in the American market -- regardless of hybrid, lithium or electric cars -- is that we Americans are different than any market and we are going to want those gasoline engines." For S-class buyers, Baker said, the "goal is not gas mileage." Two company sources say the board is considering the shift because it would help Mercedes-Benz reach strict European CO2 emissions standards and tougher corporate average fuel economy standards in the United States by mid-decade. The board also wants to use the flagship S class to highlight the company's hybrid technology. The S class traditionally has been used to showcase technological advances in the Mercedes lineup, and company executives believe S-class buyers are more willing to pay for costly green technology. Competition is also a factor. Lexus is the leader in premium vehicle hybrid sales. Last year 10 percent of all Lexus models sold in the United States were hybrids. A decision by the Daimler board is expected within three months, one company source said. 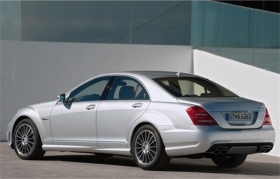 Ernst Lieb, CEO of Mercedes-Benz USA, confirmed Daimler is working on various "hybrid solutions for the S class." "It isn't how will we do it, yes or no. The question is: Do we need other variations?" Lieb said last week at the New York auto show. He would not reveal details of the discussions, but the dealer sources said the hybrid technology being proposed is in the development stage and would use lithium ion batteries. The S-class models would be full hybrids. A mild hybrid uses an electric motor and acts as a stop-start system, but the electric motor does not drive the vehicle by itself. A full hybrid can be driven short distances using only the electric motor. Mercedes-Benz now sells only a mild hybrid, the S400 -- which is the entry model for the S class and priced at $88,825, including destination. With an electric motor teamed with a 3.5-liter V-6 gasoline engine, the S400 has 30 percent better fuel economy than a comparable S550. The S400 is the only six-cylinder S class sold in the United States. But U.S. dealers say hybrid versions of the S550 V-8 model and S600 V-12 models, and the costly S63 AMG and S65 AMG, would go too far, and they fear they wouldn't be able to sell the cars. The S65 AMG costs $202,025, including freight, and is purchased for performance, not fuel economy. The biggest dealer concern is with an AMG hybrid and whether it would sell against gasoline-powered versions of the Audi S8 and BMW 7 series. Mazda will bring diesels, maybe hybrids, to U.S.
BMW, Volvo to stop offering station wagons in U.S.